When you use the word "Ultimate" in a title, it sets a high bar. 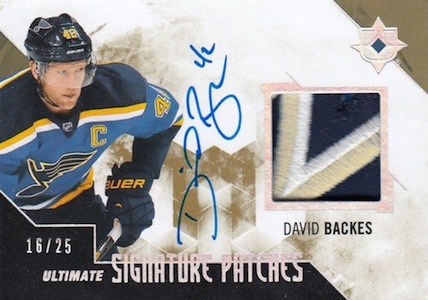 2014-15 Upper Deck Ultimate Collection Hockey stresses the autographs and memorabilia with a high-end configuration that has four hits per box. This is up from two in 2013-14. 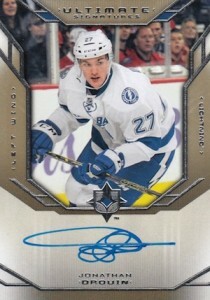 New to 2014-15 Upper Deck Ultimate Collection Hockey are a series of Obsidian autographs. These are similar to UD Black except they use a rock-styled background instead of solid black. 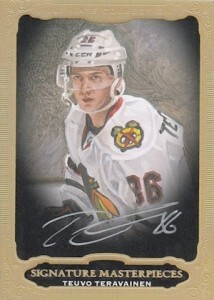 Obsidian Script autographs are inserted 1:4 boxes. 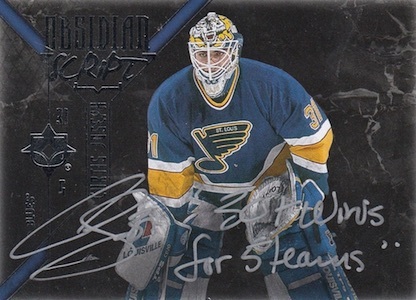 Dual-signed Obsidian Script Combos are numbered to 10. Obsidian Script Materials add memorabilia swatches. Single-player Obsidian Script Materials are numbered to 25 or less while Combo Materials are numbered no higher than 10. 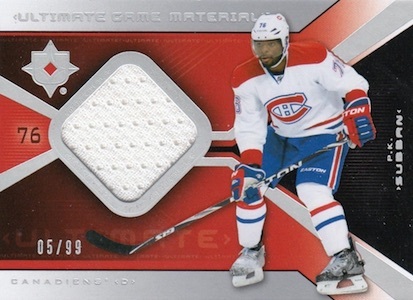 With such a hits-based configuration, collectors shouldn't be surprised to find several other memorabilia themes in 2014-15 Upper Deck Ultimate Collection Hockey. Rare Materials (#/99) have three swatches. There are also Ultimate Foursomes (1:10) and Ultimate Gear (1:4). 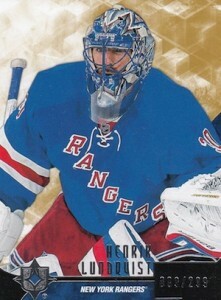 Each of these sets have numbered Gold Spectrum, Blue Spectrum and Black Foil (1/1) parallels. Ultimate Materials cards are numbered to 25. 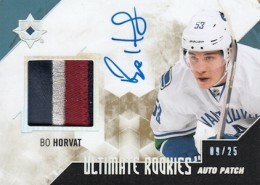 The "Ultimate" theme rounds out with Ultimate Signature Masterpieces (1:5) and Ultimate Signature Patch cards. Level 1 patches are numbered to 25 while Level 2 cards are limited to 10. There are also one-of-one Logos. Memorable Materials Combos come with two (#/49) and three (#/25) swatches. 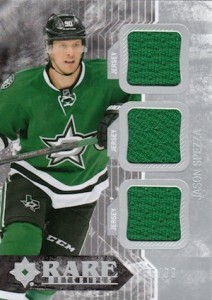 Debut Threads Patch cards come with over-sized swatches of player-worn pieces and are numbered to 100. These aren't the only rookies in the product. Depending on the player, Autographed Ultimate Rookies come numbered to 299 or 99. 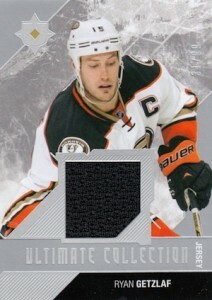 Parallels have patches (#/25) and NHL Shields (1/1). 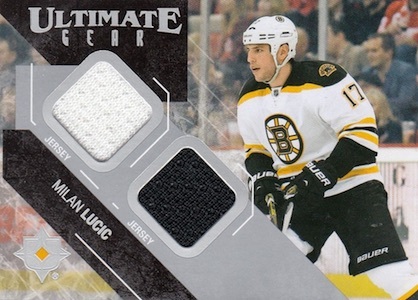 2014-15 Upper Deck Ultimate Collection Hockey does have a base set to compliment the rookies. All cards are numbered to 299. 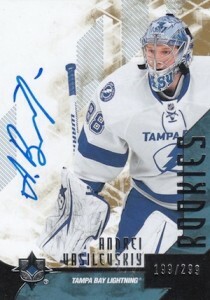 Parallels add a memorabilia spin. 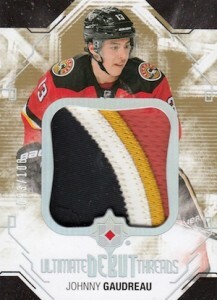 These include Jerseys (#/199), Gold Spectrum Patch (#/75), Blue Spectrum Stick (#/25) and Black Foil Button (#/2). 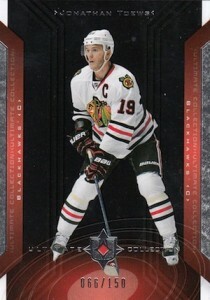 Every box has a Retro cards that takes from the tenth anniversary of 2004-05 Upper Deck Ultimate Hockey. Veterans, rookies and legends all have subsets numbered to 299. The Retro theme carries over to one autograph (Retro Ultimate Signatures - 1:4 boxes) and four memorabilia offerings: Game Jersey (#/99), Gold Game Patch (#/25), Blue Game Stick (#/10) and Black Game Tag (#/5). 50 cards. Serial numbered #/299. Individual pack odds for each group noted below. 45 cards. Serial numbered #/100. 9 cards. Serial numbered #/15. 29 cards. 1:3.3 packs. Some cards are inscribed. 38 cards. Serial numbered 1/1. 57 cards. Serial numbered #/10. christian � If you were looking at the “Best Price” thing at the top, it picks up only BIN listings on eBay and goes with the lowest at the time. It could have been for a case or was off for some reason. Looks like it will be around $200 at the time of release. I’ve had a few nice hits with this year’s Ultimate and I do really like the look compared to 13-14 but this is very much an overpriced product. It’s unfortunate too because I found UD over saturated the market once again with releasing Premier and Ultimate literally weeks apart at almost the same price point. Hmm…which would I rather? Easily Premier without thinking twice. Sure it’s more expensive but honestly not by that much. UD’s big selling point with this year’s ultimate “Now 6 cards!” oooo…wow….doesn’t really mean much if the additional cards are worthless cards. If you’re dropping $200+ on a box, you better PRAY you’re going to hit it out of the park because you’re simply not going to see the value per price on hits. I would without a doubt suggest you do random/team case breaks with your local hobby shop on this one. 2014-15 UD Trilogy Factory Sealed Hockey Hobby Box Wayne Gretzky AUTO ?? ?